Traditional 18th century Celtic music on fiddles, hammered dulcimer, harp, recorders and cello. 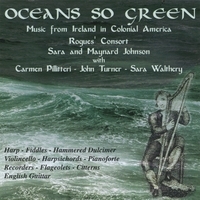 Oceans So Green: Music from Ireland in Colonial America, CD of music from Ireland, and early versions of Scottish and Welsh tunes known in Ireland, brought to early America. Several Irishmen became prominent in our early history, and are known to have brought their musicians with them. One was Sir William Johnson of Meath, hero of the French and Indian War, British Indian Agent to the Iroquois Confederacy, and adopted Mohawk, who imported a blind Irish harper to play for him at Johnson Hall. Another Irishman from Antrim, and member of the Irish House of Commons, was Governor Arthur Dobbs, sent to North Carolina, who brought his own blind Irish harper with him. He was also active in planning the French and Indian War. Many immigrants referred to as Irish were Scots Irish, once described as "a Scotchman who was rubbed through the sieve of Ireland." These Protestants of Scottish descent came for economic reasons and settled the frontiers of Pennsylvania and North Carolina. Another Irishman, Matthew Lyon from Wicklow, came as an indentured servant, but quickly paid off his indenture, became an entrepreneur and printer, and U.S. Congressman from Vermont. He became the hero of tune and song, for his role as a participant in the first duel fought in Congress, with hickory stick and firetongs. We present two tunes associated with him, one with the sounds of stick and tongs as percussion, in honor of the affair. The Alien and Sedition act was aimed at him, and he was imprisoned, reelected from prison, and rode to Congress to cast the deciding vote for Thomas Jefferson in the deadlocked 1800 election. A few Irishmen were sent here as indentured servants, others came for economic reasons, but few large groups of native Irish came until the 1840s and the potato famine. Because of the large Scots Irish emigration, Scottish music was popular here at the time of the American Revolution. We have used early arrangements of the tunes from books printed between the 1760s to the early1800s, to represent this era of the harpers, fiddlers and immigrants. A few collections had Irish, English and Scottish tunes of that earlier era. We play hammer dulcimers, including one from about 1850, recorders and flageolets, cello, a 1763 English guitar, pocket fiddle, harpsichord and spinet, plus are joined by our friends, Rogues’ Consort, which on this recording, include Scottish fiddle champion John Turner of Colonial Williamsburg on fiddle and recorder, Scottish and Irish fiddler Carmen Pillitteri and Sara Walthery, Celtic harper. The CD insert includes extensive historical notes on the music and the early Irish immigrants. This album is obviously also a history nerd's delight, leaving a trail of historical tidbits behind it. Maynard and Sara Johnson publish traditional music tune collections for hammered dulcimer, fiddle, and folk instruments as The Kitchen Musician. They are 18th Century musicians and entertainers, playing popular music of the era on instruments appropriate to the period, and research 18th century music, manners, and interesting tidbits. Their other albums include Favourite Scotch Measures; Pass’d Times: Popular Music of the Revolutionary Era; Crossing to Ireland; Chameleon and Sara with Nancy Bick Clark on Crossing to Ireland.